Sydney, Australia/Beverly Hills, CA – October 29, 2018 – While Bitcoin’s bubble has burst, the world of cryptocurrencies – and the ‘blockchain’ technology that powers them – is here to stay. That world has been shrouded in deep-tech speak by experts holding the secrets to this new economy. But now crypto and blockchain “noobs” and experts alike can listen to futurist, inventor and award-winning podcaster Mark Pesce, as he brings a refreshing clarity into this new world of CYRPTONOMICS – where everything involving money is changing. The latest episode of the first season of Cryptonomics features one of the most influential thinkers in the space, Ethereum co-creator Joe Lubin. Pesce recorded the show with him during a live interview at the University of Technology, Sydney (UTS) last week. The show can be heard at https://cryptonomics.show/2018/10/25/episode-1-09-joe-lubin-ethereum-consensys/ and on all major podcast services. In the interview, Lubin, the co-creator of Ethereum, and ‘godfather’ of the smart contract, traces his arc from his college days at Princeton to founding ‘blockchain venture studio’ ConsenSys. As Joe makes clear in the conversation, Ethereum is a process – not yet a product, and described the roadmap toward Ethereum 2.0 – taking a lot of what’s been learned since the network went live in 2016 — and fixing its shortcomings. “The “live” version of the Ethereum white paper, maintained on the Ethereum website, is an interesting read. Particularly when you remember that it was drafted by someone who was only eighteen years old at the time” says Pesce. 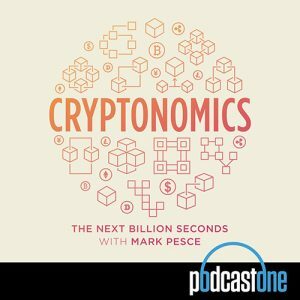 Across the first five episodes CRYPTONOMICS listeners learn the basics of the blockchain, the bonanza of Bitcoin and what it says about how money works in the 21st century. In episodes 6 to 9 (and coming Friday 2 November, episode 10) the audience is treated to discussions of some of the most important current topics in the space: fedcoins & stablecoins, evaluating ICOs for environmental impacts, the fervor surrounding the crypto/blockchain space, and now the future of Ethereum. The business of blockchain is already transforming agriculture, energy, gaming, and more – finding its way into every part of our daily lives, while from the cutting edge we’re seeing “smart contracts’, computer code blending with cryptocurrencies to create ‘smart money’ – money that thinks for itself! Pesce is joined on CRYPTONOMICS by experts including serial entrepreneur and author Mark Jeffrey, BitTrade founder Ron Tucker, Agridigital’s Emma Weston, PowerLedger’s Dr. Gemma Green, CryptoFlip’s Max Kenny, Havven’s Kain Warwick, P2P Foundation’s Michael Bauwens, and more. The guests’ insights give listeners a window onto a world where every part of our lives has been touched by blockchain technologies. Currently available on PodcastOne.com – via the PodcastOne App – or search THE NEXT BILLION SECONDS CRYPTONOMICS on Apple podcasts.